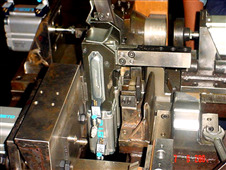 Toggle clamp is a simple Mechanism which holds instantly. 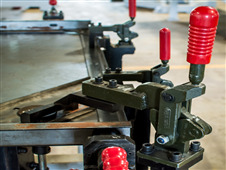 The Toggle Clamps Consist of a handle to operate, a Clamping Arm to Reach the work piece, linkages for multiplying the applied force, and a base for mounting at the workplace on it’s base. 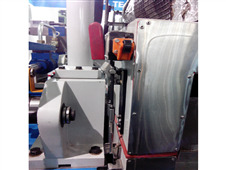 The handle is operated which thereby moves the clamping arm to hold the work piece. 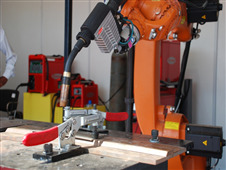 A required clamping force is achieved and exerted on the work piece. 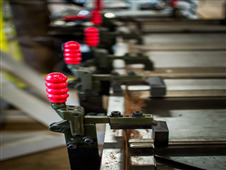 Under this action the Toggle Clamp Holds the work piece firmly and positively. 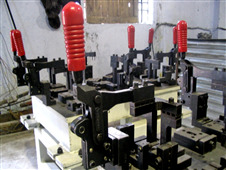 The holding capacity mentioned for each clamp refers to the maximum force, which the clamp can withstand after being over-centered without damage to the clamp and without the toggle unlocking due to distortion of the clamp. 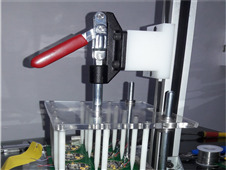 The over-center dimension is carefully chosen in relation to the elasticity of the clamp to maximize clamping force while ensuring that the clamp locks closed even under vibration or intermittent loading. 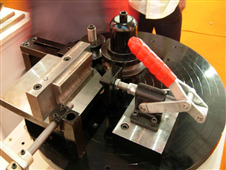 For Hold Down Clamps, holding capacity is measured with the spindle at the farthest end of the clamping arm and will increase as the spindle goes closer to the clamping arm. 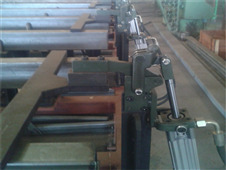 Clamping Force, the amount of force actually applied to the work piece by closing and locking the clamp, is generally less than the stated holding capacity. 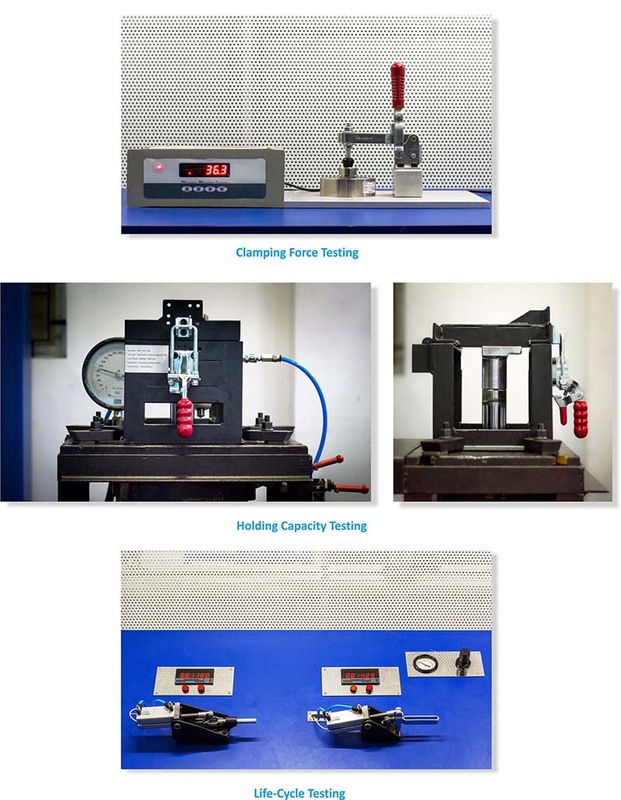 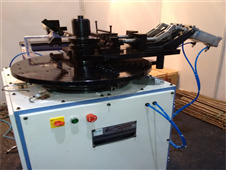 Actual clamping force depends on many factors including; spindle position, proper spindle height adjustment, spindle cushioning, work piece material and the clamps mechanical advantage. 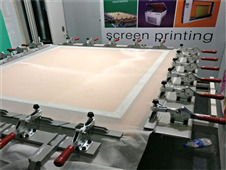 In most cases, roughly 1/3rd of the stated holding capacity can be applied by hand with medium effort. 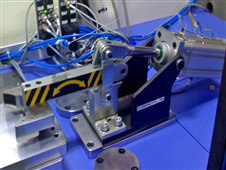 Toggle action clamps operate through a linkage system of levers and pivots. 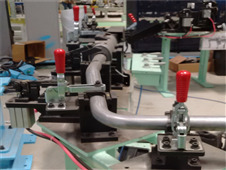 The fixed length levers, connected by pivot pins supply the action and clamping force. 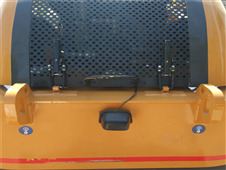 Toggle action has an over centre lock point which is a fixed stop and linkage. 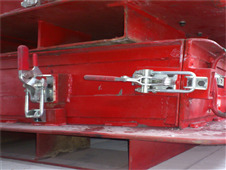 Once in the over centre position, the clamp cannot move or unlock unless the linkage is moved. 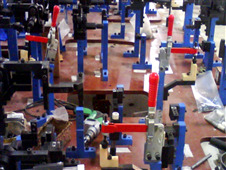 All types of toggle clamps have same action, just oriented differently. 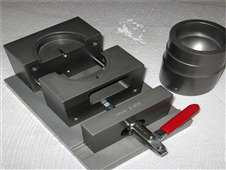 The Toggle Mechanism in a clamp has three functions. 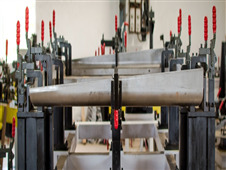 To multiply applied load at the handle into a high clamping force to hold the work piece. 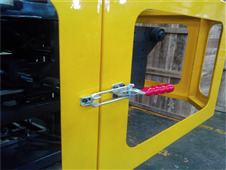 To create an over - centre lock to prevent the clamp from opening & releasing the work piece until opened by the operator. 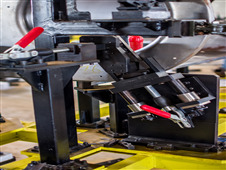 To rapidly open & close the clamp giving a maximum clearance in which to load & unload the work piece. 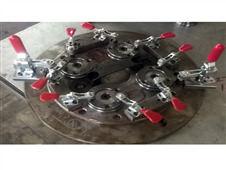 As the name implies clamps of this type hold the work piece with a downward clamping action. 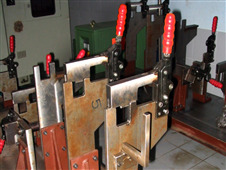 These clamps are manufactured with a holding capacity up to 3000 kgs. 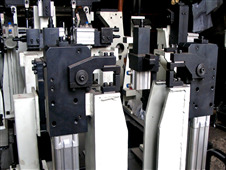 The clamping exhibits a minimum of 90o opening angle giving full clearance for loading & unloading of workpiece. 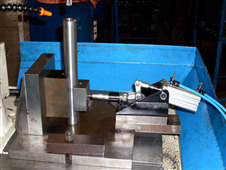 Clamping arm can be solid bar, U shaped or fixed hole to suit individual requirements. 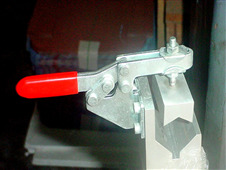 The holding action in these types of Toggle Clamps is same as VTC-Series clamp. 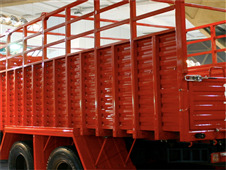 The outstanding characteristic is the low height design. 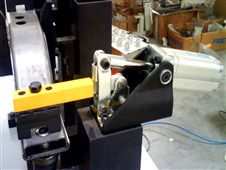 Unlike the handle & the clamping bar of the VTC-Series, these of the H-Series clamps move in opposite direction. 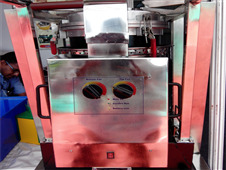 The holding capacities range upto 1,000 kgs. 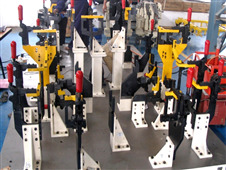 The clamping arm can be solid bar, U shaped or fixed hole type. 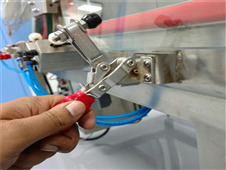 Steel-Smith's Pull Action Clamps are designed for sealing chambers, doors, mould closures or other such applications requiring closure mechanisms. 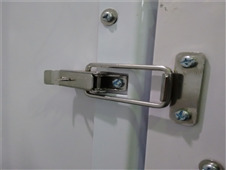 The handle can be moved to place the clamping U - Bolt Bar hook around the opposing latch & pull down to reach the lock position. 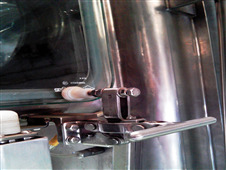 The threaded "hook" or "U-bolt” type bar offer an adjustment feature. 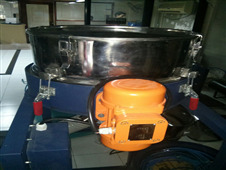 The clamps can withstand pressures from 150 kgs. 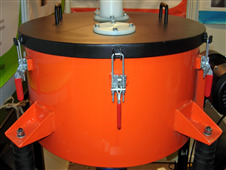 to 3000 kgs. 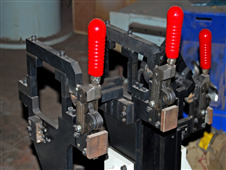 Squeeze Action Toggle Clamps hold parts with a pinching or squeezing action between two clamping jaws. 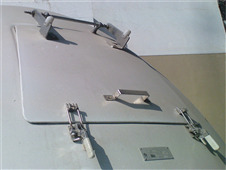 The jaws are locking automatically when closing as one or both handle are Squeeze against the central position. 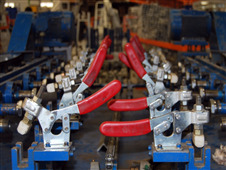 The Squeezing action of the clamps makes them well suited for applications where they can replace ‘C’ clamps. 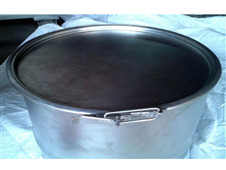 The arms are drop-forged in steel & hence can withstand heat without deformation. 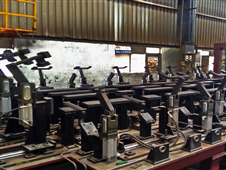 At Steel-Smith all the clamps are tested for Holding Capacities, Clamping Force and Life cycle at state-of-the art testing facilities. 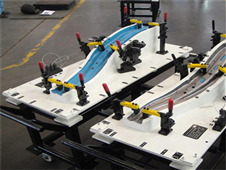 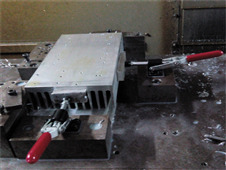 If a particular application demands a certain Holding Capacity we design and re-inforce the clamp accordingly. 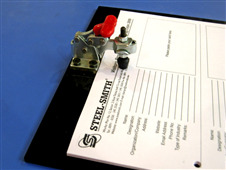 All the clamps displayed in this catalogue are rated as per these tests and results.